In the summer of 2006 we explored parts of New Mexico and Colorado, making a stop at the ancient cliff dwellings of Mesa Verde National Park. 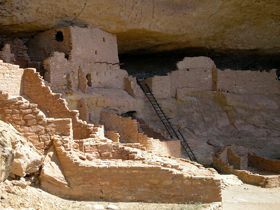 Mesa Verde, Spanish for “green table,” rises high above the surrounding country of southwest Colorado, providing a spectacular look into the lives of the Ancient Puebloan people who made it their home for over 700 years, from 600 A.D. to 1300 A.D. The National Park, containing 52,073 acres, protects over 600 cliff dwellings and 4,000 known archeological sites, only a few of which have been excavated. The Mesa Verde area was inhabited for about 800 years by agricultural people who began to drift into the area shortly after the beginning of the Christian Era (the period beginning with the year of Christ’s birth.) The first farming people in the Mesa Verde area were called Basketmakers (1-400 A.D.), because weaving excellent baskets was their outstanding craft. At this early date, the people did not make pottery, build houses, or use the bow and arrow. No sites dating from the early Basketmakers have been found within the boundaries of Mesa Verde National Park. Around the year 400 A.D., the people began to make pottery and build roofed dwellings and about 250 years later around 750 A.D., they began to use the bow and arrow. Their culture was gradually changing and during this “growth” period, archeologists call these people the Modified Basket-makers (400-750 A.D.). Pithouses were built in alcoves and on the mesa tops and dozens of these have been found on the mesas, two of which have been reconstructed. Starting about 750 A.D., the people grouped their houses together to form compact villages, which were given the name of “pueblo”, a Spanish term meaning village. Many types of house walls were used; adobe and poles, stone slabs topped with adobe, adobe and stones, and finally layered masonry. The houses were joined together to form compact clusters around open courts. In these courts were pithouses which grew deeper and finally developed into ceremonial rooms that are now referred to as kivas. 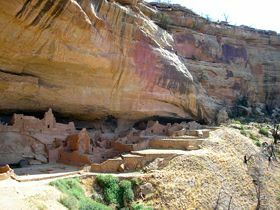 During their last century, some Ancient Puebloan Indians of Mesa Verde left the mesa tops and built their homes in the alcoves that abound in the many canyon walls. This last period marks the climax of the Pueblo culture in Mesa Verde and is known as the Classic Pueblo Period (1100-1300 A.D.). Beginning in A.D. 1276, drought struck the region and for 23 years precipitation was scarce. One by one the springs dried up and the people were in serious trouble. Their only escape was to seek regions which had a more dependable water supply. People left village after village. Before the drought ended, these people had left Mesa Verde area. The first known mention of Mesa Verde was made in 1859 when Captain J. N. Macomb explored certain territory in what is now the State of Utah. Along with him was Professor J. S. Newberry who made a geological report of the expedition and described climbing to one of the highest points of Mesa Verde, possibly Park Point, but evidently didn’t make an in-depth exploration as he made no mention of the cliff dwellings. The first cliff dwelling known to have been entered by white men, was Two-Story Cliff House in Ute Mountain Tribal Park, discovered by William H. Jackson in September, 1874. Jackson was a photographer for the U. S. Geological and Geographical Survey who had heard of the ruins from miners and prospectors. One of these prospectors, John Moss, led Jackson into Mancos Canyon where the cliff dwelling was discovered. Jackson found other small cliff dwellings in the canyon, but Two-Story Cliff House was the only one he named. The following year, the second cliff dwelling was discovered by W. H. Holmes, leader of another government survey party that passed through Mancos Canyon. Holmes named it Sixteen Window House. Over the next several decades, more explorers found places that were named Balcony House, Cliff palace, Square Tower House, and others. Unoccupied for many centuries, the pueblos were weakened by natural forces and later, some were badly damaged by looters before the area was made a National Park. Though the first known suggestion that the area should be set aside as a National Park appeared in an editorial in the Denver Tribune Republican on December 12, 1886, it would be years before any action was taken. A bill was finally introduced before Congress in February, 1901 to create the Mesa Verde National Park, but it never returned from the Public Lands Committee. From 1901 to 1905 more bills were introduced, but it would not be until June 29, 1906 that President Theodore Roosevelt established Mesa Verde National Park to “preserve the works of man,” the first National Park of its kind. Today, the continued preservation of both cultural and natural resources is the focus of the park’s research and resource management staff. 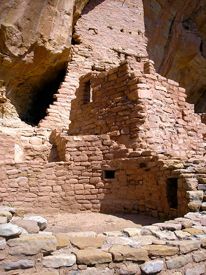 Archeological sites of many different types are accessible to visitors, ranging from pithouses built during the 500s to the cliff dwellings of the 1200s. The cliff dwellings are the most spectacular, but the mesa top pit houses and pueblos are equally important. Maximum protection must be given to the dwellings in order to preserve them. One regulation is strictly enforced: visitors may enter cliff dwellings ONLY when accompanied by a Park Ranger. However, there are over 20 mesa top sites and view points which may be visited on your own. Some sites are closed during winter. Mesa Verde National Park is in Southwestern Colorado. The Mesa Verde Headquarters is a one-hour drive from Cortez, Colorado, heading east on Highway 160 to the park turnoff, and a 1 ½ hour drive from Durango, Colorado, heading west on Highway 160 to the park turnoff. The park, which is open daily year-round, also features a Visitor Center, a museum, guided and self-guided tours, hiking trails, and a campground.